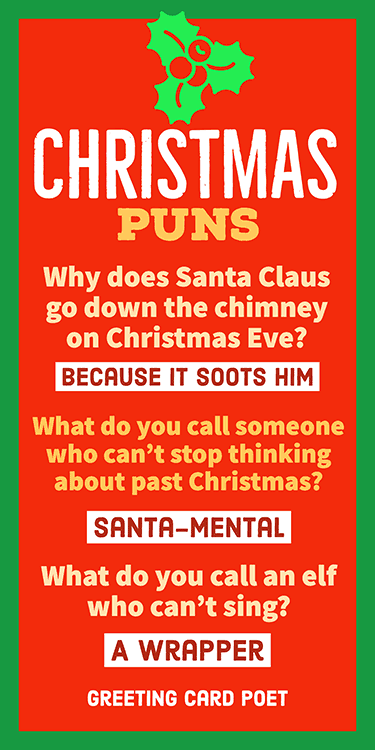 ‘Tis the season to share Christmas puns and be jolly! It’s no doubt that the holiday season is the most pun-derful time of the year and these puns fit right in with the exciting traditions associated with it. When it comes to puns, there’s just so much material to work with, from those little toy-makers in the South Pole to chimney-traversing magical reindeer and good ol’ St. Nick! All these quirky characters of the season makes it a jolly good time to enjoy silly wordplay. To help kick the season in perfect holiday style, we’ve collected a pretty cherry collection that we know Yule absolutely love. So, curl up with some Xmas cookies and hot chocolate and have a laugh or two. 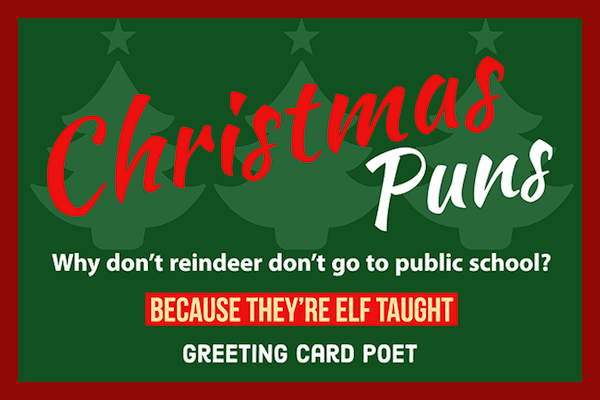 Why don’t reindeer don’t go to public school? Because they’re elf taught. Check out our 29 Buddy the Elf Quotations! What do elves like to eat on a cold day? Where is Santa Claus’ favorite swimming spot? Why wasn’t the turkey hungry at Christmas? What is a snowman’s favorite breakfast? He had no-body to go with. What do you call a greedy elf? Which of Santa’s reindeer has bad manners? What is a skunks favorite Christmas song? 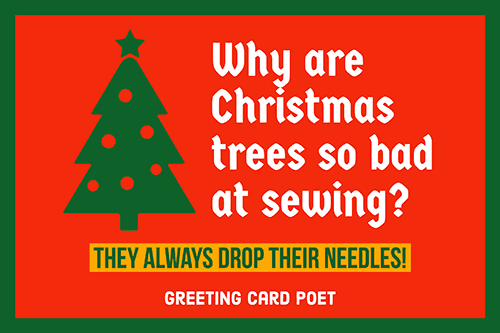 Tip: Some of these puns might serve you well on your Christmas card production. What is the cow’s holiday greeting? What is a librarian’s favorite Christmas song? What do you call a frozen elf hanging from the ceiling? You might also like Thanksgiving Puns. What does Santa say when he’s sick? What do you call Santa Clause after he’s fallen into a fireplace? What kind of fish do they have at the North Pole? Check out our Funny Christmas Quotes to make you laugh. What does a festive sheep say at Christmastime? Because he had low elf-esteem. Why did Santa go to jail? 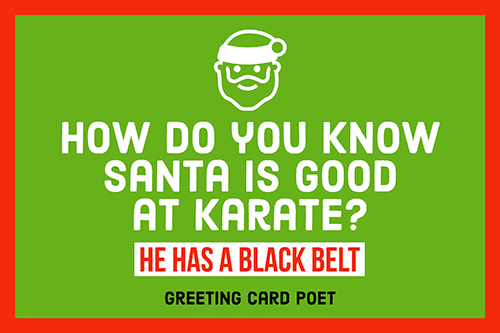 How do you know Santa is good at karate? He has a black belt. What does Santa say at the start of a race? Ready, set, Ho! Ho! Ho. What kind of motorcycle does Santa ride? You might also like Halloween Jokes. Where do Santa’s reindeer like to stop for lunch? 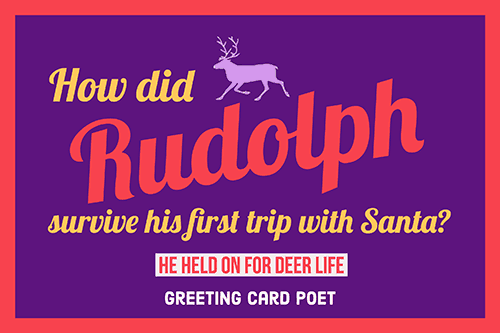 How did Rudolph survive his first trip with Santa? He held on for deer life. Did you hear that reindeer like to gather in large groups? What do you call a reindeer ghost? Tip: These Christmas puns can make great captions for photos being posted on social media. What name does Santa Claus use when he takes a rest from delivering presents? Why was everyone lucky this Christmas? Because Santa graced everyone with his presents. Why do people call Santa Claus Saint Nick? Because he’s really bad at shaving. What do you call someone who can’t stop thinking about past Christmas? What did the elf do to improve his toy making skills? He read an elf-help book. Why didn’t the elf like the eggnog? Because it’s not all what it’s cracked up to be. Let me take an Elf-ie. If athletes get athlete’s foot, the astronauts get missile toe. The fear of getting stuck while sliding down a chimney is called Santa Claus-trophbia. A cat on the beach at Christmas time is called Sandy Claws. Elves favorite subject to learn in school is the Elf-abet! Snowmen eat only Snowflakes for breakfast. Don we now our ugly Christmas sweaters. Tarzan sings Jungle Bells at Christmas time. Santa Jaws delivers presents to baby sharks at Christmas. An elf who can’t sing is called a wrapper. Santa’s dogs name is Santa Paws. Santa stay in a ho-ho-ho-tel during the holidays. Everybody likes Frosty the Snowman because he is so cool. A cat on Christmas Eve is called Sandy Claws. You’re on our Christmas Puns page.